Ghouls, goblins and ghosts galore…the haunting season is here! Enjoy it while you can, before you know it, reindeer, snowmen, and gingerbread men will be scattered across the landscapes. (Poor Thanksgiving…it gets no respect!) No tricks from us though, just treats. And by treats we mean delicious bites of news! So before you head out to wait for the Great Pumpkin, join us for this not-so-scary edition of the Compliance News in Review. The FDA has carved out time for a public hearing on November 9th and 10th to discuss the subject of communicating off-label uses of drugs and devices. The agency hopes to hear from a variety of stakeholders, including industry representatives, healthcare professionals, patients, and research institutions. Approximately 30 topics will be discussed, ranging from the effect that increased communications will have on patient enrollment in clinical trials to how patients should be made aware that they are receiving information about an off-label use. GSK is feeling a bit of a chill in the air. The company reached an agreement with the SEC to pay $20 million to resolve FCPA-related charges its Chinese subsidiary paid bribes to increase sales. As part of the settlement, GSK is also required to provide the SEC with reports regarding its implementation of anticorruption measures for the next two years. Dermatologists are receiving lots of treats from the industry. A study of 2014 Open Payments data reveals that nearly three-quarters of the country’s dermatologists received payments in 2014. Most were under $50.00, but a few of the doctors received payments totaling more than $90,000.00. The study appears in JAMA Dermatology. These are frightful times at Mylan as the company agrees to pay $465 million to settle claims it overcharged Medicaid for EpiPen. The company has come under intense fire for its pricing practices related to the product. In agreeing to the settlement, Mylan did not admit to wrongdoing. The news of the FDA’s public hearing on communication related to the unapproved uses of drugs and devices is encouraging. Hopefully, after the forum, the agency will move quickly on the release of new guidance. As court decisions are discussed in the media and more public hearings are announced, now is a great time to reinforce appropriate promotional communication through the release of updated training. The Seventeenth Annual Pharmaceutical and Medical Device Compliance Congress gets underway in just a few short weeks. The annual gathering provides an opportunity for industry professionals and experts to learn from one another and hear from representatives of enforcement agencies. Whether your focus is international compliance, U.S. compliance, transparency, or risk assessment, the conference has something for everyone. We’ve reviewed the agenda and compiled a list of what we see as some the most compelling presentations. Several sessions focus on compliance issues in managed markets. The preconference Managed Markets 101 review covers private payer systems, market access programs, and government payer systems. The session should provide helpful content and practical examples for those needing to train managed market personnel and salespeople. If you’re not able to attend the preconference, there are also two managed markets mini summits on Day 2. The morning session covers compliance issues affecting managed markets in general and the afternoon one is focused on audit and monitoring issues. We expect both to spark worthwhile discussions among panel and audience members. The Pharmaceutical Compliance Forum planners always do a great job of scheduling a variety of sessions dealing with compliance issues in markets outside of the U.S. This year is no exception, with preconference, plenary, and breakout sessions addressing global issues. Since the first transparency reports were filed by EFPIA members over the summer, unpacking what has been learned from the data, and discussing the challenges faced by companies thus far, will be of interest to anyone involved in global transparency. We are also interested in the keynote address on Day 1 by Sophie Peresson, LLM, MA, Director of Pharmaceuticals & Healthcare Programme for Transparency International. (FYI – the printed brochure has this listed as the keynote for Day 2, but the website has it scheduled as the second keynote on Day 1.) The organization, well-known for its work addressing corruption, recently focused its attention on the pharmaceutical industry, so Ms. Peresson’s presentation should be valuable for companies mapping their future transparency training plans. Finally the day two mini-summit titled, “Reimbursement Support, Patient Assistance Programs, Coupons, and Charitable Foundations” is another one on our radar. Enforcement agencies have sharpened their focus on these programs, and the area could be the next target for investigators. The panel includes both industry and legal professionals. Now, we’re interested in your opinion. 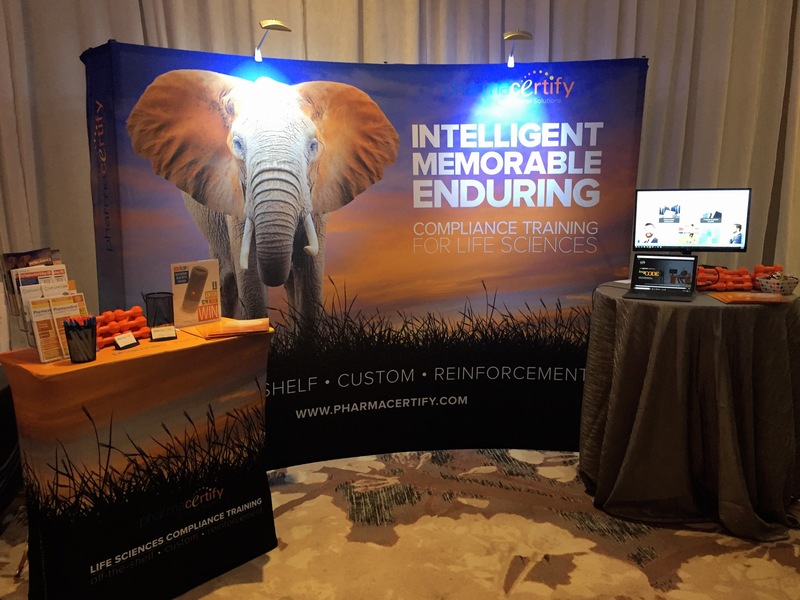 If you’re attending the conference, stop by the PharmaCertify™ booth in the exhibit hall between sessions and let us know what you think of the sessions and speakers. While you’re there, don’t forget to enter our drawing for a Bose® Soundlink® Bluetooth® speaker. See you in Washington and stay compliant! Wow, we’re already a week into May 2016. Time flies when you’re staying compliant. If policy writing, auditing, monitoring, or compliance training development kept you too busy to keep up with all of the April compliance news, not to worry, we have a summary of all the compliance news that was fit to blog throughout the month…with the ICYMI, April 2016 edition of the Compliance News in Review. A new study suggests drug ads aren’t particularly effective in prompting patients to discuss the advertised drug with their doctor. In fact, only 7% of people were moved to discuss a drug with their physician after seeing a televised ad. While they may not be motivated to speak to their physician, viewers do notice the ads. The survey found that 64% of the respondents said they believed they saw more drug ads over the past year. Shionogi received a warning letter for omitting risk information on a co-pay coupon for a drug that treats lice. The FDA said the coupon touted the efficacy of the product without stating any of the risks. The Department of Justice announced a pilot program for companies to self-report violations of the FCPA in exchange for reduced penalties. Under the program, companies that self-report and take steps to remediate identified problems will be eligible for the reduction in penalties. Pfizer and the DOJ announced the settlement of the case involving Pfizer’s Wyeth unit. The company agreed to pay $784.4 million to resolve charges it had reported false and fraudulent price information to the government. Ten of Canada’s top drug firms plan to voluntarily disclose aggregate physician and healthcare organization payment data. The movement was started by GSK Canada, and multinational firms like Abbvie, Purdue, BMS, and Lilly soon joined. CMS held a webinar for Open Payments stakeholders. The agency’s remarks focused on program timelines, in particular, the review and dispute period. A question and answer session for participants was included. The Massachusetts Medical Society is now requiring its members to disclose financial ties to industry when posting information or reviewing a medical procedure or service on the Internet. With the review and dispute period for Open Payments in full swing, it is good time to make sure those in customer facing roles are up to date on the requirements of the Sunshine Act, and your company’s procedures for addressing questions from covered recipients. Sunshine Act and Open Payments, from the PharmaCertify Foundations™ curriculum of eLearning modules, provides an overview of data collection and reporting responsibilities, and is easily modified to include your company-specific policy on how to handle questions from covered recipients. Stay compliant and here’s to a merry month of May! CMS releases a new teaching hospital list and de minimis thresholds, ICD-10 is launched, New Hampshire investigates manufacturers of painkillers, and the UK Ministry of Justice reverses its position on expansion of the law. Before you know it, all the pumpkins and scarecrows will give way to mistletoe and snowmen (insert collective groan here). Before we all run out for the annual jump into the pile of leaves, let’s grab a cup of cider and your favorite pumpkin spice treat, and review all the compliance news fit to blog, with this edition of the Compliance News in Review. October first was quite a busy day! First, CMS released the teaching hospital list and de minimis thresholds for Open Payments. In 2016, payments to Covered Recipients of $10.22 or higher will have to be reported and the annual aggregate reporting threshold will be $102.99. Second, Medicines Australia’s new transparency requirements went into effect. Even though the Code of Conduct was effective in May of this year, implementation of the new transparency requirements was delayed until October. One of the major changes in the transparency requirements was the requirement to report at an individual HCP level rather than in the aggregate. Finally, October 1st was the “go live” date for ICD -10 (International Classification of Diseases, 10th edition). ICD-10 is the set of diagnostic and procedure codes used by healthcare providers to bill insurance providers and government healthcare programs. The transition to ICD-10 was mandated by the Centers for Medicare and Medicaid Services and is intended to provide more detail over the previous coding system. CMS says ICD-10 will help better “accommodate future healthcare needs, facilitating timely electronic processing of claims by reducing requests for additional information to providers.” While specificity can be a good thing, could ICD-10 be taking it a bit far? Check out some of the more unique codes in the new system. A couple of our favorites are “W56.22xA- Struck by an Orca, initial encounter,” (which apparently spawned a whole book) and “W49.01XA Hair causing external constriction, initial encounter,” also known as the Flynn Rider Code. New Hampshire is turning a cold shoulder to opioid makers. The state’s Attorney General’s Office has announced it will be investigating the marketing practices of several manufacturers of painkillers. The AG’s Office believes the companies may have engaged in fraudulent marketing practices, which may have misled doctors and patients about the addiction risks and effectiveness of drugs. Conflicts or confluence – decisions, decisions. A recent editorial in the Journal of the American Medical Association (JAMA) makes a case for falling away from using the phrase “conflicts of interest” when describing the secondary interests involved in clinical research. The authors suggest “confluence of interest” instead. They say “conflicts of interest” automatically sets up the notion that something wrong is taking place. The authors point out that in academia, notoriety and fame could be a stronger influence on bias than financial reward. Universities, research institutes, the NIH and medical journals can all impact bias. October has certainly started with a bang, in the world of physician spend transparency, both here in the U.S. and abroad. The news offers a good reminder that transparency and disclosure measures are constantly evolving. Yet another change will be upon us in 2016 with the removal of the exclusion for speaker of faculty payments for accredited CME. With all of the changes in motion, now is a perfect time to refresh your company’s training on the requirements of the Sunshine Act and Open Payments. Ensuring your team is aware of the changes is critical, and those in the field need to understand the impact the law has on the healthcare providers they interact with on a regular basis. That’s a wrap on this edition of the Compliance News in Review. Enjoy the cool weather everyone and have a great week! Dinosaurs roamed the earth again (at least in the land of movie theaters), over the weekend, with the release of the summer’s first big blockbuster, Jurassic World. You’d think after three films, the characters would have learned not to fool with Mother Nature. Apparently not, and considering the $200+ million the film racked up at the box office, we are not tired of watching them make those same mistakes. It may not involve death, destruction and extinct creatures, but we have our own epic tale to tell. Break out the popcorn and 3D glasses, and silence your phones please. It’s time for this week’s feature presentation – the Compliance News in Review. Transparency International is undertaking a project of Giganotosaurus proportions. At the International Pharmaceutical Compliance Congress and Best Practices Forum, Executive Director Robert Barrington spoke to attendees about corruption in the healthcare sector and an initiative underway to evaluate corruption in the pharmaceutical industry specifically. The project will focus on five key areas: procurement and distribution, manufacturing, marketing practices, product registration, and research and development. Barrington noted that the industry should prepare for more scrutiny, with patients demanding to know why increased spending has not led to an improvement in the quality of healthcare. Public Citizen has accused the FDA of improperly expanding the original approved use of a sleep disorder drug, and has filed a petition with the agency to have the label changed. According to the organization, the drug was initially approved for use in treating the disorder, Non-24, in blind patients, however the drug’s label does not specify the patient population. Public Citizen says this opens the door to the drug being used for other sleep disorders with patients that are not blind. Following the initial approval, the FDA did send the manufacturer a second approval letter which stated a mistake was made and the drug was approved for treatment of Non-24 in general. The second letter notes that the condition is experienced almost exclusively by those who are blind. Could this be another “blockbuster” decision by the FDA? The FDA sent a letter to Amarin Pharmaceuticals and the court in response to Amarin’s lawsuit against the agency for violating its free speech rights. The company would like to share study information showing its drug reduces the risk of heart attack when taken in conjunction with a statin, which is not an approved use. In its response to the lawsuit, the FDA says it does not have concerns with most of the information the company wanted to share, and it does not consider the sharing of that information to be false or misleading. The letter also reminded the company that new guidelines for sharing off-label information are forthcoming. In our opinion, the letter from the FDA to Amarin is certainly not an invitation for pharmaceutical and medical device companies to start sharing information about unapproved uses of their products. Situations like this, as well decisions like the Caronia case, may lead some to think the rules have changed, when in fact they have not. Training and communication efforts need to emphasize that the laws and regulations remain the same. Promotional statements still need to be truthful, accurate, not misleading and balanced. The message should be clear – only company approved studies and statements may be shared, and done so in the way described by the company. The way in which companies play the game may be evolving, but the rules of the game remain the same. Playing within those rules benefits all stakeholders, including the company, and most importantly, the patient.